A typical earthing electrode (left of gray pipe), consisting of a conductive rod driven into the ground, at a home in Australia. Most electrical codes specify that the insulation on protective earthing conductors must be a distinctive color (or color combination) not used for any other purpose. Electrical circuits may be connected to ground (earth) for several reasons. Exposed metal parts of electrical equipment are connected to ground, so that failures of internal insulation will trigger protective mechanisms such as fuses or circuit breakers in the circuit to remove power from the device. This ensures that exposed parts can never have a dangerous voltage with respect to ground, which could cause an electric shock if a grounded person touched them. In electric power distribution systems, a protective earth (PE) conductor is an essential part of the safety provided by the earthing system. Connection to ground also limits the build-up of static electricity when handling flammable products or electrostatic-sensitive devices. In some telegraph and power transmission circuits, the earth itself can be used as one conductor of the circuit, saving the cost of installing a separate return conductor (see single-wire earth return). For measurement purposes, the Earth serves as a (reasonably) constant potential reference against which other potentials can be measured. An electrical ground system should have an appropriate current-carrying capability to serve as an adequate zero-voltage reference level. In electronic circuit theory, a "ground" is usually idealized as an infinite source or sink for charge, which can absorb an unlimited amount of current without changing its potential. Where a real ground connection has a significant resistance, the approximation of zero potential is no longer valid. Stray voltages or earth potential rise effects will occur, which may create noise in signals or if large enough will produce an electric shock hazard. The use of the term ground (or earth) is so common in electrical and electronics applications that circuits in portable electronic devices such as cell phones and media players as well as circuits in vehicles may be spoken of as having a "ground" connection without any actual connection to the Earth, despite "common" being a more appropriate term for such a connection. This is usually a large conductor attached to one side of the power supply (such as the "ground plane" on a printed circuit board) which serves as the common return path for current from many different components in the circuit. Long-distance electromagnetic telegraph systems from 1820 onwards used two or more wires to carry the signal and return currents. It was then discovered, probably by the German scientist Carl August Steinheil in 1836–1837, that the ground could be used as the return path to complete the circuit, making the return wire unnecessary. However, there were problems with this system, exemplified by the transcontinental telegraph line constructed in 1861 by the Western Union Company between St. Joseph, Missouri, and Sacramento, California. During dry weather, the ground connection often developed a high resistance, requiring water to be poured on the ground rod to enable the telegraph to work or phones to ring. Later, when telephony began to replace telegraphy, it was found that the currents in the earth induced by power systems, electrical railways, other telephone and telegraph circuits, and natural sources including lightning caused unacceptable interference to the audio signals, and the two-wire or 'metallic circuit' system was reintroduced around 1883. An electrical connection to earth can be used as a reference potential for radio frequency signals for certain kinds of antennas. The part directly in contact with the earth - the "earth electrode" - can be as simple as a metal rod or stake driven into the earth, or a connection to buried metal water piping (the pipe must be conductive). Because high frequency signals can flow to earth due to capacitative effects, capacitance to ground is an important factor in effectiveness of signal grounds. Because of this, a complex system of buried rods and wires can be effective. An ideal signal ground maintains a fixed potential (zero) regardless of how much electric current flows into ground or out of ground. Low impedance at the signal frequency of the electrode-to-earth connection determines its quality, and that quality is improved by increasing the surface area of the electrode in contact with the earth, increasing the depth to which it is driven, using several connected ground rods, increasing the moisture content of the soil, improving the conductive mineral content of the soil, and increasing the land area covered by the ground system. Some types of transmitting antenna systems in the VLF, LF, MF and lower SW range must have a good ground to operate efficiently. For example, a vertical monopole antenna requires a ground plane that often consists of an interconnected network of wires running radially away from the base of the antenna for a distance about equal to the height of the antenna. Sometimes a counterpoise is used as a ground plane, supported above the ground. Electrical power distribution systems are often connected to ground to limit the voltage that can appear on distribution circuits. A distribution system insulated from ground may attain a high potential due to transient voltages caused by arcing, static electricity, or accidental contact with higher potential circuits. A ground connection of the system dissipates such potentials and limits the rise in voltage of the grounded system. Equipment earthing conductors provide an electrical connection between the physical ground (earth) and the grounding/bonding system, which connects (bonds) the normally non-current-carrying metallic parts of equipment. According to the U.S. National Electrical Code (NEC), the reason for doing this is to limit the voltage imposed by lightning, line surges, and contact with higher voltage lines. Equipment bonding conductors or equipment ground conductors (ECG) provide a low impedance path between normally non-current-carrying metallic parts of equipment and one of the conductors of that electrical system's source. If any exposed metal part should become energized (fault), such as by a frayed or damaged conductor, it creates a short circuit, causing the overprotection device (circuit breaker or fuse) to open, clearing (disconnecting) the fault. It is important to note this action occurs regardless of whether there is a connection to the physical ground (earth); the earth itself has no role in this fault-clearing process since current must return to its source; however, the sources are very frequently connected to the physical ground (earth). (see Kirchhoff's circuit laws). By bonding (interconnecting) all exposed non-current carrying metal objects together and to other metallic objects such as pipes or structural steel, they should remain near the same voltage potential, thus reducing the chance of a shock. This is especially important in bathrooms where one may be in contact with several different metallic systems such as supply and drain pipes and appliance frames. 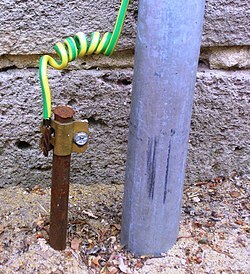 When a system needs to be connected to the physical ground (earth), the equipment bonding conductor also becomes the equipment earthing conductor (see above). A grounding electrode conductor (GEC) is used to connect the system grounded ("neutral") conductor, or the equipment to a grounding electrode, or a point on the grounding electrode system. This is called "system grounding" and most electrical systems are required to be grounded. The U.S. NEC and the UK's BS 7671 list systems that are required to be grounded. According to the NEC, the purpose of connecting an electrical system to the physical ground (earth) is to limit the voltage imposed by lightning events and contact with higher voltage lines, and also for voltage stabilization. 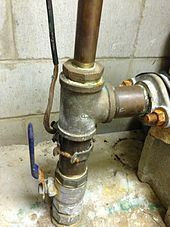 In the past, water supply pipes were used as grounding electrodes, but due to the increased use of plastic pipes, which are poor conductors, the use of an actual grounding electrode is required. This type of ground applies to radio antennas and to lightning protection systems. Permanently installed electrical equipment, unless not required to, has permanently connected grounding conductors. Portable electrical devices with metal cases may have them connected to earth ground by a pin on the attachment plug (see Domestic AC power plugs and sockets). The size of power grounding conductors is usually regulated by local or national wiring regulations. In electricity supply systems, an earthing (grounding) system defines the electrical potential of the conductors relative to that of the Earth's conductive surface. The choice of earthing system has implications for the safety and electromagnetic compatibility of the power supply. Regulations for earthing systems vary considerably between different countries. A functional earth connection serves more than protecting against electrical shock, as such a connection may carry current during the normal operation of a device. Such devices include surge suppression, electromagnetic-compatibility filters, some types of antennas, and various measurement instruments. Generally the protective earth system is also used as a functional earth, though this requires care. Distribution power systems may be solidly grounded, with one circuit conductor directly connected to an earth grounding electrode system. Alternatively, some amount of electrical impedance may be connected between the distribution system and ground, to limit the current that can flow to earth. The impedance may be a resistor, or an inductor (coil). In a high-impedance grounded system, the fault current is limited to a few amperes (exact values depend on the voltage class of the system); a low-impedance grounded system will permit several hundred amperes to flow on a fault. A large solidly grounded distribution system may have thousands of amperes of ground fault current. In a polyphase AC system, an artificial neutral grounding system may be used. Although no phase conductor is directly connected to ground, a specially constructed transformer (a "zig zag" transformer) blocks the power frequency current from flowing to earth, but allows any leakage or transient current to flow to ground. Low-resistance grounding systems use a neutral grounding resistor (NGR) to limit the fault current to 25 A or greater. Low resistance grounding systems will have a time rating (say, 10 seconds) that indicates how long the resistor can carry the fault current before overheating. A ground fault protection relay must trip the breaker to protect the circuit before overheating of the resistor occurs. High-resistance grounding (HRG) systems use an NGR to limit the fault current to 25 A or less. They have a continuous rating, and are designed to operate with a single-ground fault. This means that the system will not immediately trip on the first ground fault. If a second ground fault occurs, a ground fault protection relay must trip the breaker to protect the circuit. On an HRG system, a sensing resistor is used to continuously monitor system continuity. If an open-circuit is detected (e.g., due to a broken weld on the NGR), the monitoring device will sense voltage through the sensing resistor and trip the breaker. Without a sensing resistor, the system could continue to operate without ground protection (since an open circuit condition would mask the ground fault) and transient overvoltages could occur. Where the danger of electric shock is high, special ungrounded power systems may be used to minimize possible leakage current to ground. Examples of such installations include patient care areas in hospitals, where medical equipment is directly connected to a patient and must not permit any power-line current to pass into the patient's body. Medical systems include monitoring devices to warn of any increase of leakage current. On wet construction sites or in shipyards, isolation transformers may be provided so that a fault in a power tool or its cable does not expose users to shock hazard. Circuits used to feed sensitive audio/video production equipment or measurement instruments may be fed from an isolated ungrounded technical power system to limit the injection of noise from the power system. In single-wire earth return (SWER) AC electrical distribution systems, costs are saved by using just a single high voltage conductor for the power grid, while routing the AC return current through the earth. This system is mostly used in rural areas where large earth currents will not otherwise cause hazards. Some high-voltage direct-current (HVDC) power transmission systems use the ground as second conductor. This is especially common in schemes with submarine cables, as sea water is a good conductor. Buried grounding electrodes are used to make the connection to the earth. The site of these electrodes must be chosen carefully to prevent electrochemical corrosion on underground structures. A particular concern in design of electrical substations is earth potential rise. When very large fault currents are injected into the earth, the area around the point of injection may rise to a high potential with respect to distant points. This is due to the limited finite conductivity of the layers of soil in the earth. The gradient of the voltage (changing voltage within a distance) may be so high that two points on the ground may be at significantly different potentials, creating a hazard to anyone standing on the ground in the area. Pipes, rails, or communication wires entering a substation may see different ground potentials inside and outside the substation, creating a dangerous touch voltage. Signal grounds serve as return paths for signals and power (at extra low voltages, less than about 50 V) within equipment, and on the signal interconnections between equipment. Many electronic designs feature a single return that acts as a reference for all signals. Power and signal grounds often get connected, usually through the metal case of the equipment. Designers of printed circuit boards must take care in the layout of electronic systems so that high-power or rapidly switching currents in one part of a system do not inject noise into low-level sensitive parts of a system due to some common impedance in the grounding traces of the layout. Voltage is measured on an interval scale, which means that only differences can be measured. To measure the voltage of a single point, a reference point must be selected to measure against. This common reference point is called "ground" and considered to have zero voltage. This signal ground may be connected to a power ground. 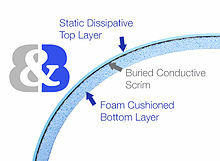 A system where the system ground is not connected to another circuit or to earth (though there may still be AC coupling) is often referred to as a floating ground or double-insulated. Some devices require a connection to the mass of earth to function correctly, as distinct from any purely protective role. Such a connection is known as a functional earth- for example some long wavelength antenna structures require a functional earth connection, which generally should not be indiscriminately connected to the supply protective earth, as the introduction of transmitted radio frequencies into the electrical distribution network is both illegal and potentially dangerous. Because of this separation, a purely functional ground should not normally be relied upon to perform a protective function. To avoid accidents, such functional grounds are normally wired in white or cream cable, and not green or green/yellow. In television stations, recording studios, and other installations where signal quality is critical, a special signal ground known as a "technical ground" (or "technical earth", "special earth", and "audio earth") is often installed, to prevent ground loops. This is basically the same thing as an AC power ground, but no general appliance ground wires are allowed any connection to it, as they may carry electrical interference. For example, only audio equipment is connected to the technical ground in a recording studio. In most cases, the studio's metal equipment racks are all joined together with heavy copper cables (or flattened copper tubing or busbars) and similar connections are made to the technical ground. Great care is taken that no general chassis grounded appliances are placed on the racks, as a single AC ground connection to the technical ground will destroy its effectiveness. For particularly demanding applications, the main technical ground may consist of a heavy copper pipe, if necessary fitted by drilling through several concrete floors, such that all technical grounds may be connected by the shortest possible path to a grounding rod in the basement. 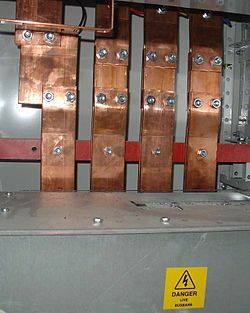 Busbars are used for ground conductors in high-current circuits. Lightning protection systems are designed to mitigate the effects of lightning through connection to extensive grounding systems that provide a large surface area connection to earth. The large area is required to dissipate the high current of a lightning strike without damaging the system conductors by excess heat. Since lightning strikes are pulses of energy with very high frequency components, grounding systems for lightning protection tend to use short straight runs of conductors to reduce the self-inductance and skin effect. Strictly speaking, the terms grounding or earthing are meant to refer to an electrical connection to ground/earth. Bonding is the practice of intentionally electrically connecting metallic items not designed to carry electricity. This brings all the bonded items to the same electrical potential as a protection from electrical shock. The bonded items can then be connected to ground to bring them to earth potential. In an electrical substation a ground (earth) mat is a mesh of conductive material installed at places where a person would stand to operate a switch or other apparatus; it is bonded to the local supporting metal structure and to the handle of the switchgear, so that the operator will not be exposed to a high differential voltage due to a fault in the substation. In the vicinity of electrostatic sensitive devices, a ground (earth) mat or grounding (earthing) mat is used to ground static electricity generated by people and moving equipment. There are two types used in static control: Static Dissipative Mats, and Conductive Mats. A static dissipative mat that rests on a conductive surface (commonly the case in military facilities) are typically made of 3 layers (3-ply) with static dissipative vinyl layers surrounding a conductive substrate which is electrically attached to ground (earth). For commercial uses, static dissipative rubber mats are traditionally used that are made of 2 layers (2-ply) with a tough solder resistant top static dissipative layer that makes them last longer than the vinyl mats, and a conductive rubber bottom. Conductive mats are made of carbon and used only on floors for the purpose of drawing static electricity to ground as quickly as possible. Normally conductive mats are made with cushioning for standing and are referred to as "anti-fatigue" mats. For a static dissipative mat to be reliably grounded it must be attached to a path to ground. Normally, both the mat and the wrist strap are connected to ground by using a common point ground system (CPGS). In computer repair shops and electronics manufacturing workers must be grounded before working on devices sensitive to voltages capable of being generated by humans. For that reason static dissipative mats can be and are also used on production assembly floors as "floor runner" along the assembly line to draw static generated by people walking up and down. Isolation is a mechanism that defeats grounding. It is frequently used with low-power consumer devices, and when electronics engineers, hobbyists, or repairmen are working on circuits that would normally be operated using the power line voltage. Isolation can be accomplished by simply placing a "1:1 wire ratio" transformer with an equal number of turns between the device and the regular power service, but applies to any type of transformer using two or more coils electrically insulated from each other. For an isolated device, touching a single powered conductor does not cause a severe shock, because there is no path back to the other conductor through the ground. However, shocks and electrocution may still occur if both poles of the transformer are contacted by bare skin. Previously it was suggested that repairmen "work with one hand behind their back" to avoid touching two parts of the device under test at the same time, thereby preventing a circuit from crossing through the chest and interrupting cardiac rhythms/ causing cardiac arrest. Generally every AC power line transformer acts as an isolation transformer, and every step up or down has the potential to form an isolated circuit. However, this isolation would prevent failed devices from blowing fuses when shorted to their ground conductor. The isolation that could be created by each transformer is defeated by always having one leg of the transformers grounded, on both sides of the input and output transformer coils. Power lines also typically ground one specific wire at every pole, to ensure current equalization from pole to pole if a short to ground is occurring. In the past, grounded appliances have been designed with internal isolation to a degree that allowed the simple disconnection of ground by cheater plugs without apparent problem (a dangerous practice, since the safety of the resulting floating equipment relies on the insulation in its power transformer). Modern appliances however often include power entry modules which are designed with deliberate capacitive coupling between the AC power lines and chassis, to suppress electromagnetic interference. This results in a significant leakage current from the power lines to ground. If the ground is disconnected by a cheater plug or by accident, the resulting leakage current can cause mild shocks, even without any fault in the equipment. Even small leakage currents are a significant concern in medical settings, as the accidental disconnection of ground can introduce these currents into sensitive parts of the human body. As a result, medical power supplies are designed to have low capacitance. Class II appliances and power supplies (such as cell phone chargers) do not provide any ground connection, and are designed to isolate the output from input. Safety is ensured by double-insulation, so that two failures of insulation are required to cause a shock. ^ To keep impedance low, ground wires should avoid the unnecessary bends or loops shown in this picture. Holt, Mike (14 November 2013). "Grounding - Safety Fundamentals". youtube video. Mike Holt Enterprises. Retrieved 4 February 2019. ^ "The Electromagnetic Telegraph". du.edu. Archived from the original on 2007-08-04. ^ Jensen Transformers. Bill Whitlock, 2005. Understanding, Finding, & Eliminating Ground Loops In Audio & Video Systems. Archived 2010-02-21 at WebCite Retrieved February 18, 2010. ^ Beltz, R.; Cutler-Hammer, Atlanta, Georgia; Peacock, I.; Vilcheck, W. (2000). "Application Considerations for High Resistance Ground Retrofits in Pulp and Paper Mills". Pulp and Paper Industry Technical Conference, 2000. ^ Electrical and electronics diagrams, IEEE Std 315-1975, Section 3.9: Circuit return. ^ "ESD Prevention Measures Part 2: Using Anti Static Mats by Doug Wagner". Bennett & Bennett. Archived from the original on June 3, 2015. Retrieved May 15, 2014. ^ "Wrist Strap Shown with mat and Common Point Ground System (CPGS)". Bennett & Bennett. Archived from the original on April 24, 2014. Retrieved April 23, 2014. ^ "Dell laptops in electric-shock shocker". cnet.com. 17 January 2008. Archived from the original on 8 February 2014. Wikimedia Commons has media related to Earthing. Look up ground in Wiktionary, the free dictionary. Electrical Safety chapter from Lessons In Electric Circuits Vol 1 DC book and series.